Fill out the form with any questions or inquiries you have for the sales consultants at Lakewood Hills. You can also call or chat with us for immediate responses. The smartly designed Mooreville invites family interaction, with a spacious great room and neighboring kitchen with sizeable island and adjoining nook. Enjoy family game night in the upstairs game room, or relax and dine al fresco on the covered rear patio. Step inside Mooreville to see the Life-Tested Home Designs® with more usable space where you want it most. So you live the way you want to live. Two-story ceilings in the foyer greet you as you enter the spacious Mooreville, known for a first floor bedroom with full bath and upstairs game room. Beautiful birch cabinetry and granite countertops enhance the open island kitchen, which also features a walk-in pantry. The smartly designed Mooreville invites family interaction, with a spacious gathering room and neighboring open island kitchen and adjoining nook. Enjoy family game night in the upstairs game room, or relax dining al fresco on the covered rear patio. At Pulte Homes, we believe smart home design is about improving the function of a space while enhancing its aesthetic. That’s why we talk with prospective homeowners about how they live in their homes and what they want most in their next home. The result is a collection of smart Life Tested® designs that can be incorporated into some Pulte floor plans to add the kind of stylish features and functional space you’ll want to use all the time. We continually reach out to home buyers and Pulte homeowners to get feedback to improve our home designs. It's what we call Life Tested. 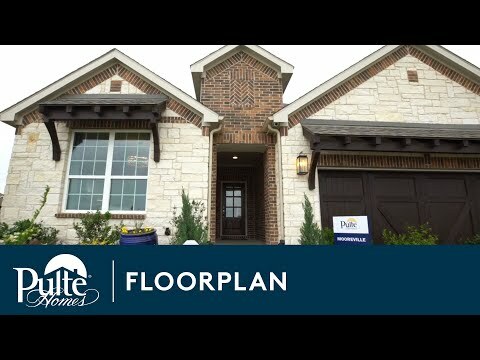 Manage your home more efficiently with Pulte's Planning Center. This unique, multi-functional space allows you a place to manage your busy life and stay organized. Enjoy life clutter free with Pulte's Everyday Entry. Located off the garage, Everyday Entry provides an area for life's stuff as soon as you walk in the door. Many of our homes offer energy-efficient features that can help reduce your home’s energy consumption while maintaining everything you want in a new home. That’s the Pulte Energy Advantage®. From understanding the stages of construction to choosing the right Pulte partner, we are here for you throughout the build process. Create the home you've always wanted with inspirational design ideas and thoughtful home solutions for your new Pulte home. Continue on I-465 N and follow signs for I-465 E.
Use the right lane to take exit 31 for Meridian St toward US-31. Continue onto US-31 N/N Meridian St. Take exit 127 toward W Main Ave.
At the traffic circle, take the 3rd exit onto W Main Ave.
At the traffic circle, take the 1st exit onto Spring Mill Rd. At the traffic circle, take the 2nd exit onto W 141st St.
At the traffic circle, take the 1st exit onto Ditch Rd. Turn left on 166th St. Turn left of Towne Rd. Bent Creek will be on the right.